This week Boston had the largest January snow storm on record--24 1/2 inches. It was predicted well in advance. "Snow Day!" I thought. "I can sit inside and quilt and watch the snow accumulate outside." That so did not happen! I spent the snow day snow-blowing and shoveling. And catching up with neighbors-- that's one of the great things about Big Snow in this city. (My neighbor @franklin.e, an artist at work at home during the storm, did a watercolor of me shoveling show. It's on IG at #snowdraw. How cool is that)!! I did find some time yesterday to finish up my Modern take on Bonnie Hunter's "Grand Illusion" 2014 Winter Mystery quilt. It was made from the orphan blocks I had left over after I decided to make the quilt twin size instead of queen size. This morning I went out and shoveled around the fence in the backyard so I could take some photos to share with you. Then I went out front and put the quilt on a sunny snow drift in the front yard to get the photos of the quilting. That's why the photos are a bit ripply! 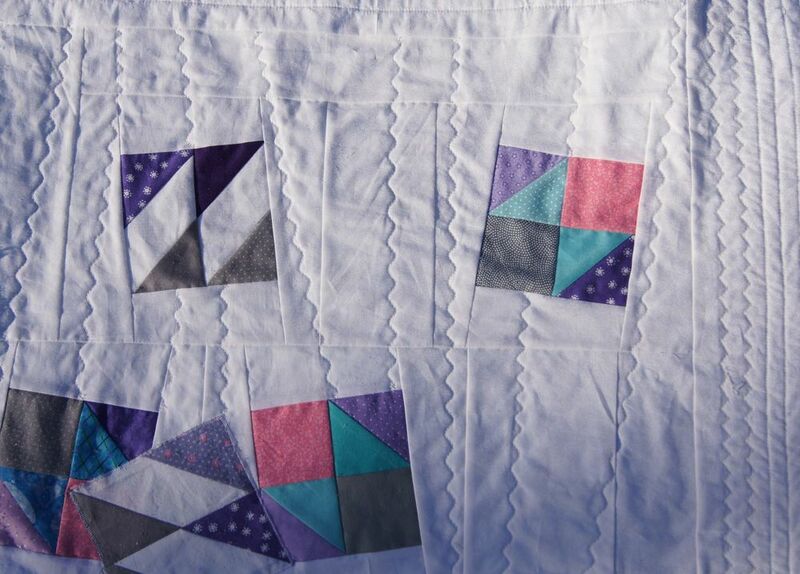 This modern quilt is a snapshot of the assembly of the "Grand Illusion" quilt. (Click the link to see my completed "Grand Illusion" quilt top). Top to bottom: Outer border, inner border, "exploded block" on the left, block components on center right, blocks falling off the sewing table bottom left and completed block on the bottom right. 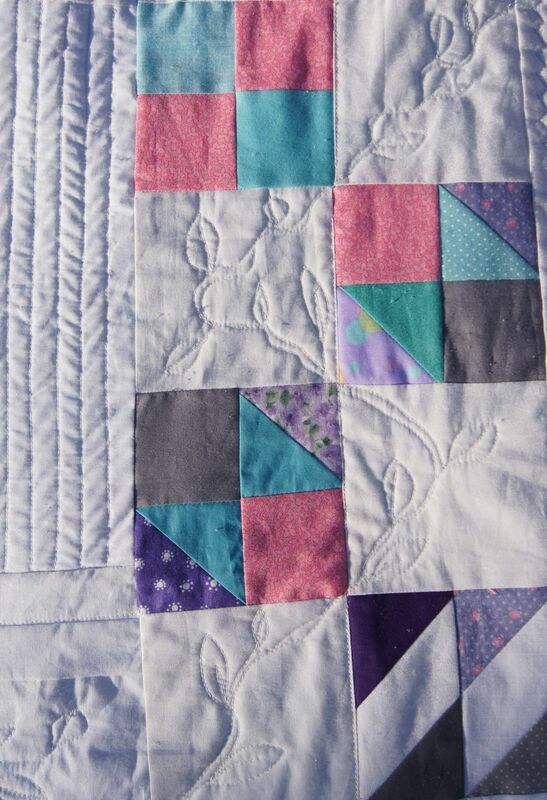 Here are some pictures of the quilting. I used my walking foot for the geometric/straight quilting and did free motion quilting for the flowers and vine. I used the serpentine stitch (#4 on my Bernina) to create the motion of the blocks falling off the table onto the floor. And here is the back. The backing fabric wasn't wide enough so I added some the left over border strips. Now, time to tackle quilting my real "Grand Illusion" quilt! !